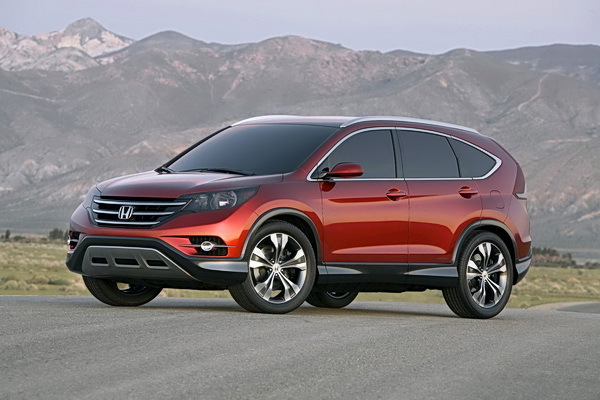 The new Honda CR-V goes for a distinctive new design and bold styling direction. Compared to the previous generation CR-V, the concept model has a more aggressive stance with deeper sculpting of the body lines and a bolder front grille. Overall the lower front bumper design integrates more smoothly into the fascia for improved aerodynamics and curves upward to convey off-road capability. There are also five-spoke alloy wheels and bolder fender flares. Powertrain details haven’t been released, but the new CR-V is expected to be outfitted with a more efficient engine and deliver improved fuel economy. Also look for more interior room and reduced curb weight. Ummm, that looks pretty darn sweet. It looks bigger too. I’m definitely interested now.